This weekend has seen another major convention in the US, and as always it’s worth keeping an eye on developments from US distributors, as these have a tendency to trickle down to the UK in due course. There’s been a significant gap in the US market the last couple of years, ever since Bandai Entertainment ceased operations as a distributor of home media outside of Japan. With no Beez and no Bandai, there have been several titles that have been conspicuously absent on shop shelves. In Europe we’ve actually had a head start on getting these titles back, with Kazé releasing Code Geass on Blu-ray early this year, and just last month, Cowboy Bebop making its English speaking Blu-ray debut courtesy of Anime Limited. These were developments that had US fans quite green in the face, but no longer as this weekend at Otakon, it was revealed that most of the Sunrise properties held by Bandai previously now have new homes. They also added the Code Geass: Akito the Exiled title, which to this point had only been licensed for Australia. There’s no mention as to release dates and formats at this time, but if The Vision of Escaflowne doesn’t get a Blu-ray release, there is something seriously wrong with the world. In non Sunrise news, Funimation also announced that they had licensed the rest of Fairy Tail, up to episode 175 at this point, and added the release date for Wolf Children, November 11th. That isn’t all, as Sentai Filmworks revealed their slice of the Sunrise Pie. That pretty much leaves Gundam and Planetes in the Sunrise catalogue yet to find a US home. Otherwise you may also wonder when K-On! Season 1 will be rescued for the US, as well as The Melancholy of Haruhi Suzumiya, also Bandai releases, but not via Sunrise. Speaking of Cowboy Bebop, at Otakon, Daisuki revealed that for the first time the adventures of Spike and the Gang will be streamed to the world via their website. Speaking again of Cowboy Bebop, its creator Shinichiro Watanabe revealed that the next series that he will be working on is once again set in space. This time it will be a pure comedy called Space Dandy! Nothing to do with Cowboy Bebop, but Viz Media revealed that they still have the licence to Ranma ½. It’s coming back for a new generation of fans, and all 151 episodes plus movies and OVAs will be available again on DVD, and also for the first time via their Neon Alley streaming site, and, wait for it... on Blu-ray! 151 episodes of an anime, on Blu-ray! News links from Anime News Network and Fandom Post. The reviews this week begin with Sweet Blue Flowers, a.k.a. Aoi Hana. This one’s a Region 1 import, a show that I was instantly smitten with when I first saw it on Crunchyroll. It’s the sort of anime that rarely gets a UK release, as it’s about as far from the mainstream as you can get. 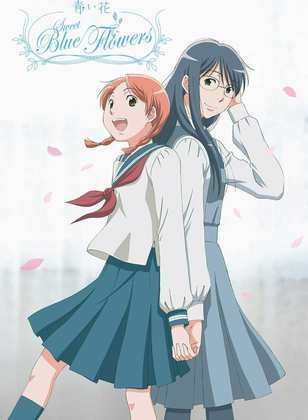 It’s a show about first love between high school girls, a story that focuses on character and emotion, and a show with breathtakingly beautiful animation. It hasn’t got any ninja in, which precludes it from ever being licensed for the UK, which is a terrible shame as it greatly adds to the variety in the medium and is well worth checking out. 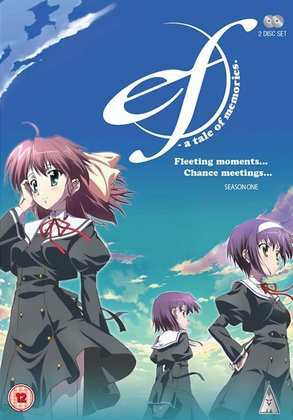 There’s more romance in ef ~ a tale of memories, but this show comes from the tragicomic supernatural side of things, a genre that has been dabbled in once before in the UK with the release of Clannad. ef ~ a tale of memories offers something slightly different though, by toning down the comedy, the supernatural, and avoiding the moe tropes and clichéd characters. In fact this is a tragicomic romance where the emphasis is on romance, three markedly different relationships, and it’s quite the impressive show. 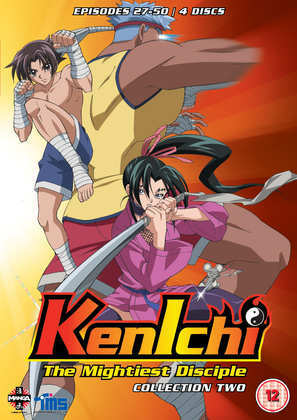 I then took a look at Kenichi: The Mightiest Disciple: Season 2. The first half of this show was a blast, a fish out of water show, which has the most unlikely action hero winding up training with the most skilled martial arts masters around, so tough that their eyes can turn into light beams or black pits of doom at will. The wimpy Kenichi took a vow to get stronger, and wound up attracting the wrong kind of attention from the toughest delinquents. In this second series, he’s no longer the wimp, and the attention from the Ragnarok delinquent gang gets more intense. Somehow it manages to hold onto the comedy that made the first season so charming. Finally, Stuart McLean took a look at Daphne in the Brilliant Blue: The Complete Series. I reviewed the single volumes some years back, but this is the first time the series has been released as a complete collection in the UK. It’s a sort of Charlie’s Angels set in a Waterworld future, where the Nereids group are an ocean dwelling fix-it group who help people in need, all the while in the skimpiest of costumes. It’s a show that grew on me (like a limpet) when I first watched it. Click on the review to see if it had a similar effect on Stuart. Sweet Blue Flowers was released by Lucky Penny earlier this year. ef ~ a tale of memories: Collection got released by MVM last Monday, as did Kenichi The Mightiest Disciple: Season 2 from Manga Entertainment. Daphne in the Brilliant Blue: The Complete Series will be released by MVM on the 19th of August.